BIRMINGHAM, Ala. — Alabama’s Christian conservatives see Roy Moore as their champion. He has battled federal judges and castigated liberals, big government, gun control, homosexuality, Muslims and anything else that doesn’t fit the evangelical mold. The state’s motto — “We dare defend our rights” — is an upfront acknowledgement of a fighting spirit that has put Alabamians at odds with the rest of the nation for generations. Perhaps more importantly, there is a deep-seated trust that leaves many willing to accept Moore’s denials and discount the word of women speaking out weeks before the Dec. 12 election after decades of public silence. For some, Moore is more like a biblical prophet speaking out for God than a politician. For some, Moore is more like a biblical prophet speaking out for God than a politician. Introducing Moore during a “God Save America” rally at a south Alabama church this week, pastor Mike Allison said his support wasn’t wavering because Moore never has. Since the allegations of sexual misconduct surfaced, leading Washington Republicans, though not President Donald Trump, have abandoned him. Yet Moore still holds almost magical appeal for many. Fearful of angering Moore’s supporters, the Alabama GOP has stuck with him, and voters like Larry Gibbs are putting their confidence in the Vietnam veteran long known as the “Ten Commandments judge,” for putting shrines to the commandments in his courtroom and then in the Supreme Court rotunda. “He comes up here to the church and he’s quoting scripture and he relates to us,” said Gibbs, who attended the pro-Moore rally where Allison spoke. Even a relative of one of Moore’s accusers is publicly siding with Moore. “He fought like hell to keep the Ten Commandments in the damn courthouse,” said a Facebook live video by Darrel Nelson. Nelson said his father, John Alan Nelson, is married to Beverly Young Nelson, who publicly accused Moore of sexually assaulting her as a teen. Nelson’s lawyer, Gloria Allred, refused comment on any relationship between her client and Darrel Nelson. But Beverly Nelson’s son Spencer Harris has referred to Darrel Nelson as his stepbrother in his own Facebook posts supporting his mother. Moore is polarizing — a big reason his fans like him — and local opponents see him as a Bible-thumping opportunist playing on peoples’ religion. Moore lost badly in bids for the Republican gubernatorial nomination in 2006 and 2010. That reputation carried over to Etowah County, where Moore was an assistant prosecutor and circuit judge. He didn’t typically join in the banter common in so many small-town, Southern courtrooms. 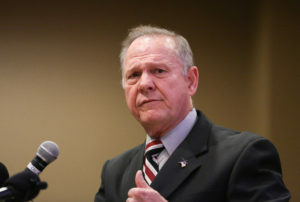 With a conservative view of religion at his core, Moore instead fought the American Civil Liberties Union over courtroom prayer and the wooden Ten Commandments plaque in his courtroom and rode the publicity to election as Alabama’s chief justice. He was removed from the job twice for violating state judicial ethics — once for ignoring a federal court order to remove a Ten Commandments monument from the state’s judicial building and again over opposing gay marriage after the U.S. Supreme Court effectively legalized it. Conservative backers view those ousters as badges of honor. Longtime Moore supporter John Giles said Moore doesn’t bend or change, and his voters value that. In his role as an outsider and fighter, Moore is a bit like George C. Wallace, the one-time segregationist who served four terms as Alabama’s governor. But the closest any of Alabama’s previous populist politicians might have come to the current allegations against Moore might have been those made against Gov. Jim Folsom in the 40s, said retired University of Alabama historian William H. Stewart. “Kissing Jim” was alleged to have had a son out of wedlock and was known for kissing women on the campaign trail. “But we haven’t had any instances of a candidate dating or making sexual overtures to a girl as young as 14,” said Stewart. AP video journalist Johnny Clark contributed to this report from Jackson, Alabama.